If you ever go to Vancouver, you have to go to this Japanese hot dog food stand called Japadog. There are several locations all around town, but it’s the best late night snack to satisfy your cravings for warm salty stuff. They have a variety of flavors and toppings on their hot dogs, ranging from wasabi mayo, yakisoba noodles (yes, noodles on top of a hot dog), bonito flakes, sesame seeds, tobiko, you name it. For Clement and Frances’ (Mrs. F Yu) superbowl party this year, they made it Japanese themed — “Samurai Superbowl.” They made us delicious Japanese curry, other people brought sushi, chicken teriyaki, hamachi kama (!! ), and i decided to bring some Japadog to Texas. 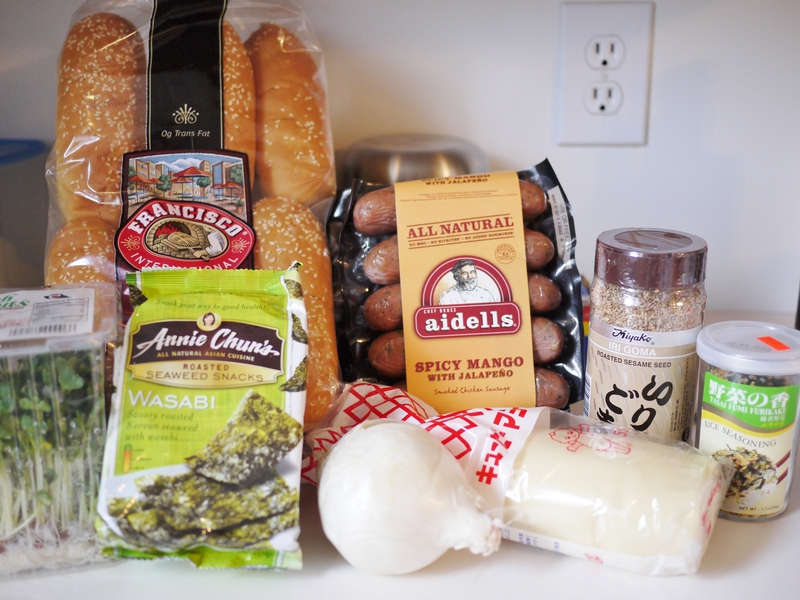 I bought most of my ingredients from Costco and Kazy’s gourmet (this japanese market that my friend Christina introduced me to that sells hamachi kama and sashimi-grade fish….supposedly where all the Japanese restaurants in Dallas buy their fish at). furikake and onion were found in the fridge. Spread butter on the hot dog buns and toast in the oven until golden brown and crispy. Broil or bake the hot dogs in the oven according to instructions (I would have grilled, but didn’t have enough time. Also I think the real Japadog marinates their hot dog buns in teriyaki sauce overnight….also didn’t have time for that). Cut the seaweed slices into small strips. Slice the onion, saute until caramelized. 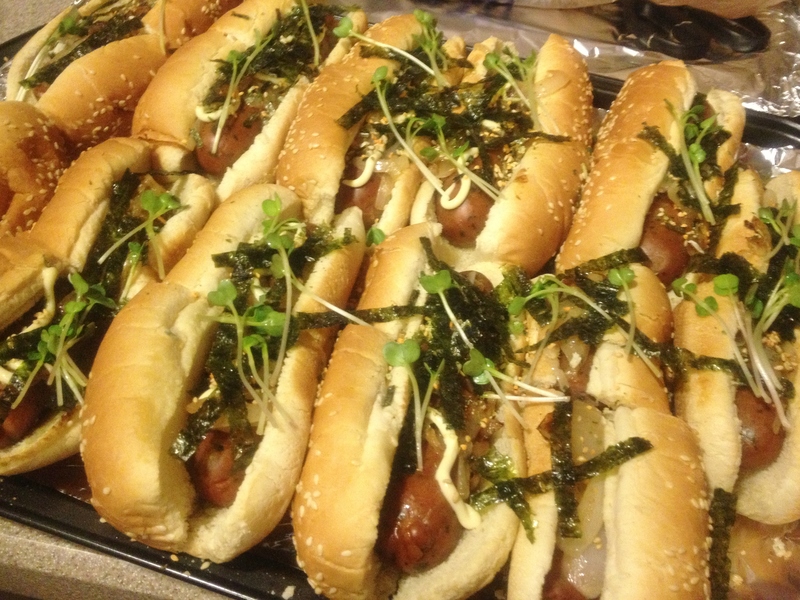 Assemble the hot dogs and buns, top with caramelized onions, seaweed slices, sprouts, Japanese mayo, and sprinkle sesame seeds and furikake on top. And there you have it….JAPADOG!! !